Ernakulam district is the commercial hub of Kerala with huge potential as a tourist spot. In fact it is one of the places which receives the highest number of vacationers in Kerala. To support these ever increasing footfalls in the district there is a requirement of good transport connectivity within the district as well with various prominent cities and districts of the country. 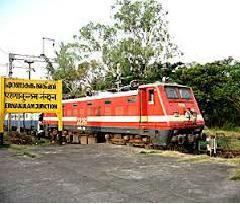 The district has altogether 17 railway stations of which the major ones are Ernakulam Town and Ernakulam Junction. All the metro cities and major destinations have direct trains to Ernakulam district.